Not only because of his place in American history as the founder of a chain of missions in Mexico and California, but also because of his life of priestly zeal and heroic virtue, Fray Junipero Serra, OFM, was chosen as the patron of our apostolate. This gifted Franciscan friar had occupied the Duns Scotus chair of philosophy in Mallorca, Spain, until he felt the call to commit himself further to the service of Christ as a missionary in the New World. Departing from Cadiz, Spain, in 1748, he made the perilous crossing of the Atlantic Ocean in a small ship, landing at Veracruz on the southern shore of the Gulf of Mexico. From there, he journeyed on foot to Mexico City, where tradition has it that he prayed at the church built over the famous site where the Virgin of Guadalupe appeared to St. Juan Diego in 1531. Fray Junipero Serra was transferred to the Sierra Gorda region at his own request, and was appointed President of the Sierra Gorda missions in 1751. After nine years, he was asked to undertake his missionary work some 1,200 km away on the Pacific coast of the North American continent, much of the time suffering with an ulcerated leg. Fr. Serra and his fellow Franciscan friars eventually established a chain of missions in Alta California and worked tirelessly to bring Christ to the indigenous peoples. After a lengthy period of missionary activity, Fr. 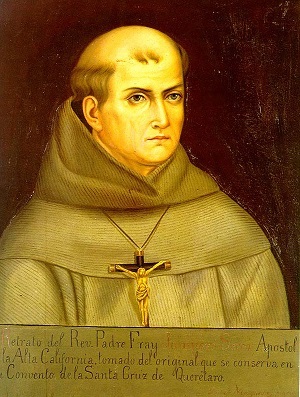 Serra died in 1774 at the San Carlos Borroméo de Carmelo Mission, in Carmel, California, U.S.A. his favorite mission. Despite the fact that, during his time as a missionary, Father Serra had very little involvement with promoting priestly vocations, today it can only be considered providential that a holy priest who demonstrated such zeal for the salvation of souls would be chosen as the patron of our global vocations apostolate, considering that the primary focus of its work is fostering and promoting vocations to the holy priesthood and to supporting the sacred ministry of priests, those who spend and consume themselves for the salvation of souls.